We are happy and Smiling to share another very special narrated story with you and everyone. Julia’s Smile is the story of a little girl that is born without the ability to smile and the journey she must take to find her own unique Smile within herself. Julia’s birthplace is a special home – a place where everyone manifests whatever they Wish in their imaginations, which makes them smile all the time. But along comes a little girl, Julia, who can never seem to smile no matter what. This situation slowly creates a problem for everyone in the town, and especially for Julia herself, who must challenge herself to find her Inner Smile – not only for herself but for others as well. This is a story for children of all ages to explore what makes us truly Smile in Life. It will reveal the power we all have to affect our world and the people around us. We wish you a Joyful and Smiling story experience and hope you will SHARE it with everyone around you – and perhaps bring them a New Smile into their lives! 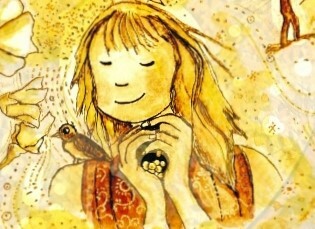 To listen to other stories, please visit the rest of the website at www.storyyoga.wordpress.com, including stories in Russian, with more languages to come! Buy and Share This Special Book! Join the StoryYoga Community! Follow now!